You don't often find fennel in Moroccan cuisine, but I love it's pairing with the green olives and preserved lemons so much, it feels like a no brainer. This is one of those light and comforting stews that goes down easy and doesn't feel like you've swallowed a brick afterwards. In a small food processor, puree the ingredients for the marinade. (Or, alternatively, you can mince by hand). Place the chicken in a medium mixing bowl and cover with the marinade. Rub the mixture into all the crevices of the meat, including under the skin, until very well coated. Cover and refrigerate for at least 2 hours. 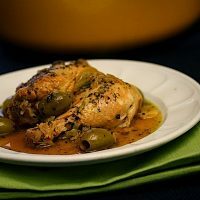 In a large Dutch oven or lidded casserole, heat the olive oil over medium-high heat. Remove the chicken from the marinade and brown it in batches, about 5 minutes per side. Remove and set aside. Add the onion to the pot and sauté until translucent, about 5 minutes, scraping up any brown bits from the bottom. Add the chicken back to the pot, along with the fennel, chickpeas, chicken stock, and any remaining marinade. Bring to a boil over high heat, then turn back to low and simmer, covered for 45 minutes. Add the preserved lemon, olives, and thyme (if using). Cover and simmer for another 20 minutes, until the chicken is very tender, but not falling apart. Taste for seasoning, and add salt and pepper as needed. 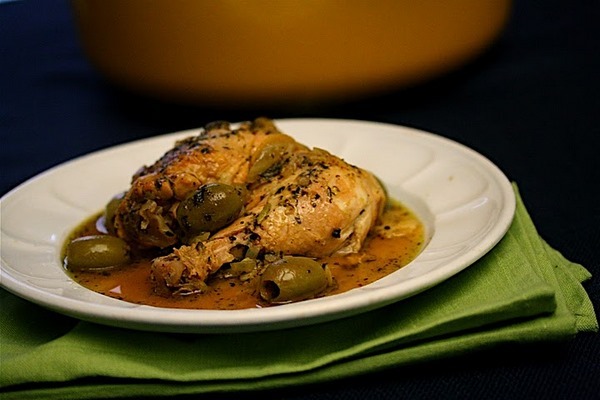 To serve, place one chicken leg on each plate and spoon the broth over the top, making sure to get some of the olives, fennel, and chickpeas. Serve alongside couscous and/or crusty bread.